A wink. A thought, quickly quelled. But did he beat me? and all through my house. 4 of them? I may faint… someone hold me ;) WELL DONE girlfriend!! Well DONE! Accused of being too hot! Steam hand-press; steam my inseams. Been to a steam bath? Me neither; strange concept, eh? Off your chest; cleanse your torment. It’s full steam ahead with you! Wow! Life can be good! Steamy enough for you dear? Can’t believe you both beat Knarf. Love it!! So they tricked..! They delayed me so much at Bryden’s It’s a wonder I got what I’ve got in Haiku Poems. Rising like steam over its surface. Sun baked rain soaked road. Vapour, like steam, drift skyward. Love sends two hearts steaming. Did she come in first? Or be steaming mad losing? Oh she is so bad. I think she had me steaming. Down Main Street she steamed so fast. Now did the store close? Will she go full steam? In time to be first once more? Sorry Knarf, they BOTH beat you!! I’m grinning ear-to-ear!!! Holy steamy..! Well done, as always. Am I sensing a pattern to these themes? Perhaps a little karma coming around next week for getting too steamy this week? BRING IT ON! Mine is scheduled but I am gonna go ahead and link up! .-= Jessica´s last blog ..Emergency Room Psychic =-. You are so blessed, Jenn. I love your Haiku and I love all of theirs, done with love. Take care of yourself, Jenn. .-= Thom´s last blog ..Sensational Haiku Wednesday – Steam =-. Thanks for the comments etc. if you have another post then I’m more than happy but don’t stress if you don’t. I managed to get my haiku in this week, can’t believe I missed two weeks. I’m keeping Wednesdays free of scheduled posts so I can do a haiku each week. Great haiku as always and a great topic too. Hope the eyes are going well with the contacts etc. .-= Jade @ No Longer 25´s last blog ..A Googlable 1 Year Blogiversary =-. .-= stephanie (bad mom)´s last blog ..maelstrom =-. .-= Bing (PinkLady)´s last blog ..The Raging Fire Within =-. Waaaay too truthful, Knarf ;) Poor Zack, rotting from the inside out. What DO you feed him?? surface dew! wow…very expressive this week! I’m loving all the haikus that are out there! 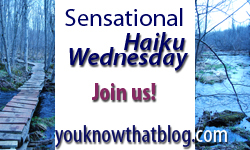 .-= Polly´s last blog ..Sensational Haiku Wednesday-Steam =-. .-= Mama Zen´s last blog ..Scratch -N- Sniff =-. Sorry I couldn’t play today, Jenn. someone forgot to pay for my domain renewal [insert innocent whistle]. That over sight has been corrected and I am back up and running.